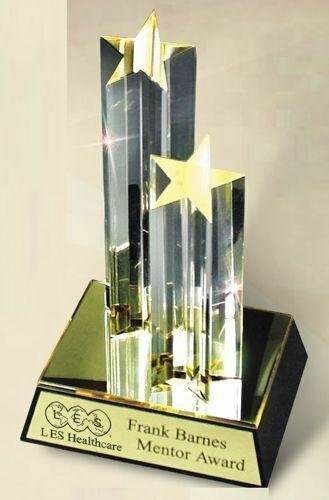 The Acrylic Award Trophies category has a wide variety of acrylic awards that have a star theme. The Diamond Towers Blue Award makes an elegant corporate award for recognizing exceptional achievement. The acrylic awards contains 1 inch thick clear acrylic diamond shaped towers with a blue mirrored bottom. They are majestically presented on a black base with a laser engraved black aluminum plate. Three sizes have 4 diamond columns. The overall size includes the base and all demensions are approximate. The Diamond Towers Gold Award makes an elegant corporate award for recognizing exceptional achievement. The acrylic awards contains 1 inch thick clear acrylic diamond shaped towers with a blue mirrored bottom. They are majestically presented on a black base with a laser engraved black aluminum plate. Three sizes have 4 diamond columns. The overall size includes the base and all demensions are approximate. 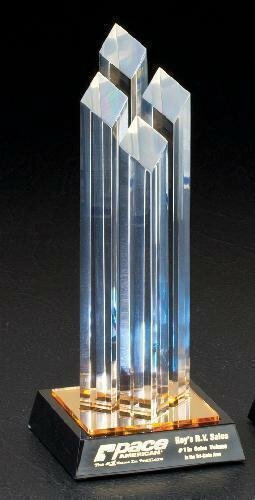 The Diamond Towers LargeAward makes an elegant corporate award for recognizing exceptional achievement. 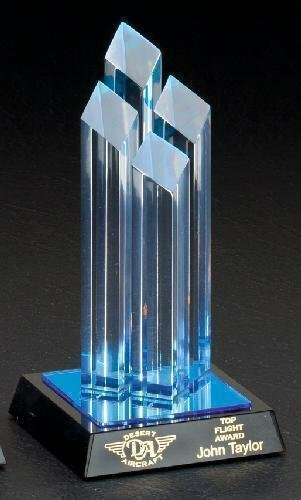 The acrylic awards contains 1 inch thick clear acrylic diamond shaped towers with a blue mirrored bottom. They are majestically presented on a black base with a laser engraved black aluminum plate. 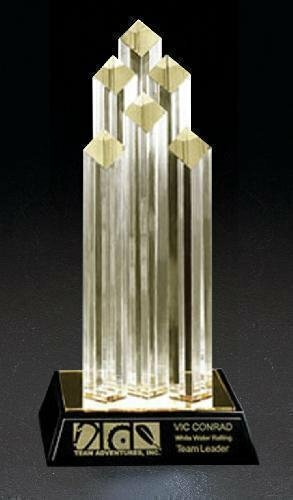 This acrylic award has 6 diamond columns. The overall size includes the base and all demensions are approximate. 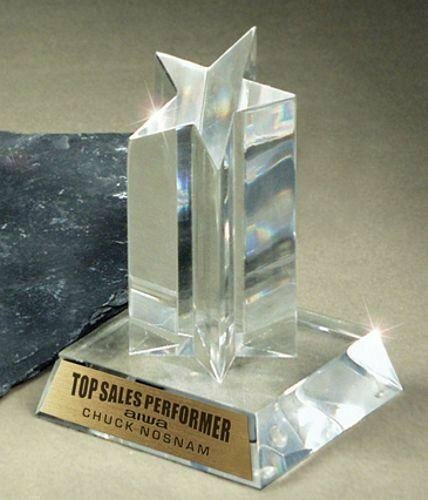 The Star Acrylic Award Clear makes an excellent business award. This acrylic trophy comes with brushed gold aluminum plate with a black imprint. FREE Shipping is provided on orders of corporate awards over $100. FREE personalization is included on each corporate award. 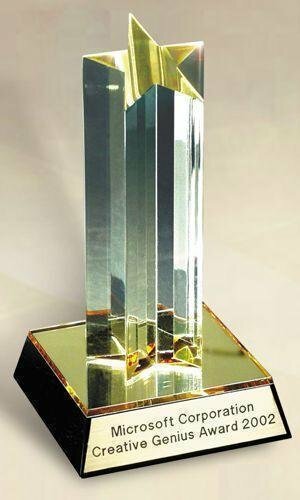 The Star Acrylic Award Double Tower makes an excellent business award. This acrylic trophy comes with brushed gold aluminum plate with a black imprint. Your logo can usually be included on these beautiful awards at no additional cost provided that vector artwork or a high quality black and white image is uploaded at checkout. The Star Acrylic Award Single Tower makes an excellent business award. This acrylic trophy comes with brushed gold aluminum plate with a black imprint. Tidal series acrylic with printed purpe violet accent and matching colored base. 1/2” thick clear acrylic. Individually gift boxed.